Christie’s Post-War and Contemporary Art Evening Auction will present work by some of the great artists of the 20th Century alongside those currently at the forefront of their artistic practice. The season will be led by Francis Bacon’s Figure in Movement (1972, estimate: £15,000,000-20,000,000), a seminal work which creates a vivid sense of the transition from life to death, and Gerhard Richter’s Schädel (Skull) (1983, estimate on request), unveiled for the first time in 30 years. Alongside these are masterpieces by American Contemporary artists Jeff Koons and Mark Grotjahn, as well as the finest examples of European Post-War Abstraction with works by Lucio Fontana, Piero Manzoni, Yves Klein, Jean Dubuffet and Pierre Soulages, and German artists such as Georg Baselitz, Anselm Kiefer, Martin Kippenberger, Albert Oehlen and Sigmar Polke. Three works from the personal collection of Paul Maenz and 12 works by Francis Bacon and Lucian Freud (see separate post here) will be offered, the largest and most diverse selection of works ever offered at auction by the artists. The Post-War and Contemporary Art Evening Auction will be held on 4 October 2018 and is followed by the Post-War and Contemporary Art Day Auction on 5 October 2018. All works will be exhibited at King Street from 28 September 2018. Jeff Koons, Cracked Egg (Blue) (1994-2006, estimate: £10,000,000-15,000,000). © Christie’s Images Limited 2018. With its monumental scale, vibrant colour, elegant contours and dual mirrored surface, Cracked Egg (Blue) (19942006, estimate: £10,000,000-15,000,000), is an icon of Jeff Koons’s sculptural practice. A feat of technical virtuosity, engineered to precision over a twelve-year period, it is one of the central works in Koons’s landmark Celebration series, taking its place alongside masterpieces such as Balloon Dog and Tulips. 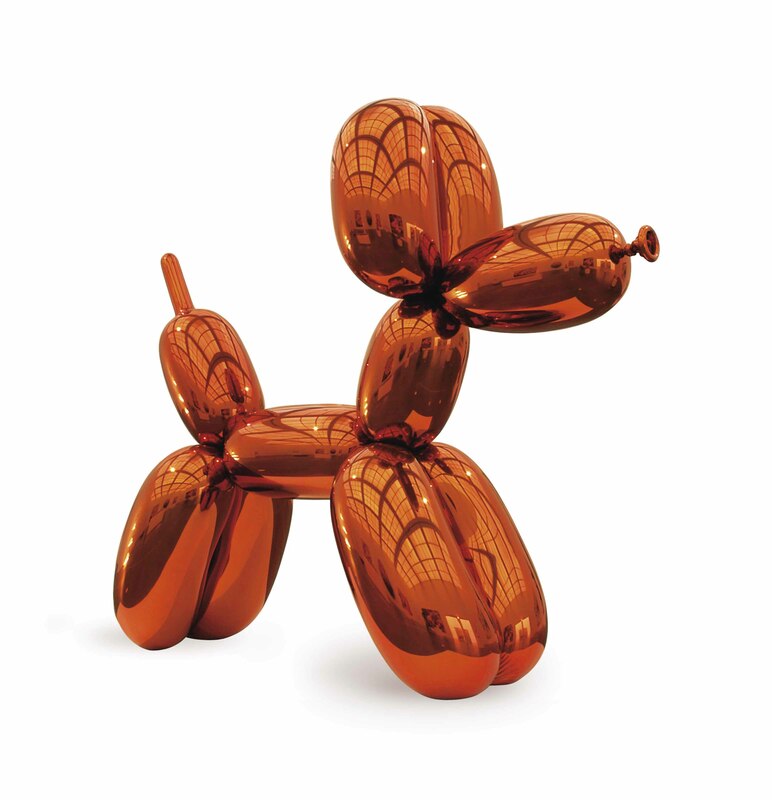 The current auction record for any living artist was set by Jeff Koons’s Balloon Dog (Orange), 1994-2000, which sold for $58,405,000 at at Christie’s New York on November 12, 2013. Mark Grotjahn’s Face Paintings combine expressive abstraction and kaleidoscopic hues, with strong connections to the mask-like faces rendered by Picasso and Matisse. Within Untitled (Yellow and Green Low Fall Face 41.80) (2011, estimate: £6,000,000-8,000,000) a palette of whites, greens, yellows, blues and blacks conjures an animated surface of movement and colour. Bright light appears to explode from the centre of intertwined lines that subtly intimate the features of a face. Keith Haring, Untitled (1984, estimate: £3,000,000-5,000,000). © Christie’s Images Limited 2018.
and Keith Haring’s Untitled (1984, estimate: £3,000,000-5,000,000). One of the most influential gallerists of his generation, Maenz had a pivotal impact on the international art world during the 1970s and 1980s, introducing new waves of Avant-garde artists to both European and American audiences. Working closely with artists, curators and critics, Maenz gave voice to some of the most pioneering movements of the time: most notably Conceptualism, Arte Povera, Italian Transavanguardia and Neo-Expressionism. The works presented from his collection offer a snapshot of this world during the mid-1980s, capturing the spirit of political subversion, painterly radicalism and restless creative optimism that captivated Maenz during this period. ‘Beyond the Monochrome’ brings into focus the seminal achievements of Lucio Fontana, Piero Manzoni and Yves Klein. United by their far-reaching innovations in relation to the picture plane, the artistic process, materiality, spirituality and transcendence, Fontana, Manzoni and Klein together forged a new era. Concetto spaziale, Attese (1959, estimate: £1,200,000-1,800,000) is an early example of Fontana’s tagli or ‘slashes’, which ruptured the canvas as part of his Spatialist mission to introduce an infinite fourth dimension into the work of art. Made in the same year, Untitled Blue Monochrome (IKB 276) (1959, estimate: £4,000,000-6,000,000) exemplifies Klein’s ‘International Klein Blue’ monochromes, through which art became a portal to the unknown. Manzoni’s Achrome (1957-58, estimate: £3,000,000-5,000,000) takes the monochrome to absolution, creating a colourless surface of pure, limitless potential. Held in the same collection since the 1980s, and featured in the Hirshhorn Museum & Sculpture Garden’s major Jean Dubuffet retrospective in 1993, Madame au Jardin (Lady in the Garden) (1956, estimate: £2,500,000-3,500,000) is a romantic large-scale work from the artist’s important series of Assemblages. Never before seen in public, Peinture 162 x 114 cm, 29 août 1958 (1958, estimate: £1,800,000-2,200,000) is a dramatic large-scale oil painting by Pierre Soulages. It has been held in the same private collection for the last 60 years, and dates from a defining decade in the artist’s career. The diversity of German contemporary art is represented by a group of 13 works by Georg Baselitz, Anselm Kiefer, Martin Kippenberger, Albert Oehlen and Sigmar Polke. Georg Baselitz’s inverted portrait Fingermalerei - Haubentaucher (Finger Painting - Great Crested Grebe) (1972, estimate: £1,000,000-1,500,000) is one of the earliest works within his series of Fingermalerei (‘Finger-Paintings’) which encompass birds, trees and self-portraits, some of his most significant motifs. This is presented alongside Baselitz’s 11 P.D. Füße (11 P.D. Feet) (1960-63, estimate: £6,000,000-10,000,000), a seminal suite of early works depicting wounded feet. A third work by the artist, Locke (Tress) (1990, estimate: £500,000-700,000), is a totemic example of his sculptural portraits. Anselm Kiefer’s Die Ungeborenen (The Unborn) (1978, estimate: £700,000-1,000,000) is one of the earliest examples where he explores the theme of a netherworld of unborn people, ideas and creative possibility. In contrast, the sophisticated psychedelia of Sigmar Polke’s Mexiko (1977-79, estimate: £1,200,000-1,800,000), depicts saguaro cacti in saturated hues of green and purple against a white ground; at the foot of the foremost cactus is a Jeep, revealed only by its purple shadows while two people stand to the centre. Dreiteiliges Genähtes (Three-Piece Sewn) (1988, estimate: £2,500,000-3,500,000) is a monumental abstraction by Polke, which towers three metres in height, comprised of four pieces of translucent fabric sewn together. Martin Kippenberger’s Ohne Titel aus der Serie Krieg Böse (Untitled from the Series War Wicked) (1991-92, estimate: £800,000-1,200,000) is from a seminal series that formed an ongoing conceptual riposte to the high seriousness of Neo-Expressionists. Painted on a dramatic scale, Albert Oehlen’s Untitled (1989, estimate: £1,000,000-1,500,000) is a frenzy of techniques that marks the birth of his abstract period while, Bigote (Moustache) (2003, estimate: £500,000700,000) is a vast, shimmering and playful work from his series of Grey Paintings. Stretching over three metres in height, Untitled (2010, estimate: £1,500,0002,000,000) is a monumental example of Rudolf Stingel’s Baroque-inspired works. Executed in 2010, its shimmering painterly surface confronts the viewer like a piece of ornamental architecture or a fragment of decorative carpet. Country Club (2003, estimate: £1,000,000-1,500,000) is an early painting from Hurvin Anderson’s celebrated ‘Country Club’ series. Poised between figurative and abstract worlds, it depicts a deserted tennis court bathed in tropical heat, inspired by photographs taken on an artist’s residency in Trinidad, following in the footsteps of his former teacher Peter Doig. Ball Watching IV (2003, estimate: £350,000-550,000) is a deeply personal work that combines Anderson’s central thematic concerns: the vicissitudes of memory, the presence of the past, the barriers erected between cultures and the mutability. Unveiled for the first time in 30 years, Gerhard Richter’s Schädel (Skull) (1983, estimate on request) is one of the highlight works of Christie’s Frieze Week auction series. Last exhibited in January 1988 at the Galerie Fred Jahn, Munich, Schädel (Skull) is the first of the iconic series of only eight skull paintings created that year. Held for 41 years in the prestigious collection of Magnus Konow, Figure in Movement can be placed among an extraordinary group of works painted in the aftermath of George Dyer’s tragic death the previous year. In addition to this are some of the very first works in Bacon’s catalogue raisonné, chronicling Bacon’s formative influences of furniture design and the contemporary innovations of the European avant-garde. The present group includes Painted Screen (circa 1930, estimate: £700,000-1,000,000), the earliest surviving largescale work and a precursor to his famed triptychs. These are presented alongside early paintings by Lucian Freud including Man in a Striped Shirt (1942, estimate: £1,000,0001,500,000), a portrait of Richard Chopping painted when Freud was just 19 years old, and Head of a Woman (circa 1980, estimate: £350,000-450,000), one of the artist’s earliest depictions of his friend Susanna Chancellor. .
Another chief source of inspiration for Hockney is the image of the pool. Hockney’s discovery of his most famous subject matter corresponded to his arrival in Los Angeles nearly a decade earlier. Already celebrated as an enfant terrible of Contemporary art by the time he left the Royal College of Art in London in 1962, Hockney had first traveled to California in January 1964. The place held a magnetic draw for the artist, who had immersed himself in the potent idealism of its sun-drenched landscape, and the California that he had found in magazines, movies and the gay novels of John Rechy. Here, he felt free to invent the city, giving it a promptly recognizable, iconic form. "[Los Angeles was] the first time I had ever painted a place," Hockney later explained. "In London I think I was put off by the ghost of Sickert, and I couldn’t see it properly. In Los Angeles, there were no ghosts... I remember seeing, within the first week, the ramp of a freeway going into the air and I suddenly thought: My God, this place needs its Piranesi; Los Angeles could have a Piranesi, so here I am" (D. Hockney, quoted in S. Howgate, David Hockney Portraits, exh. cat., National Portrait Gallery, London, 2006, p. 39). 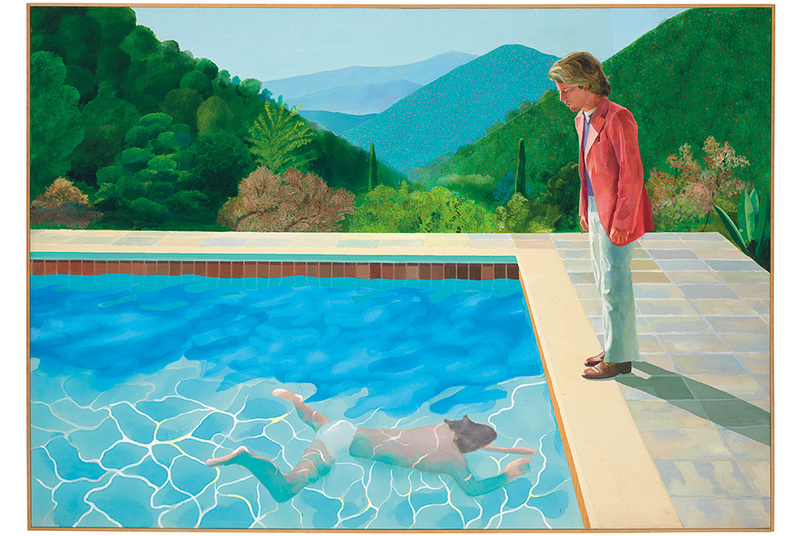 The auction current record for David Hockney was set by Pacific Coast Highway and Santa Monica, 1990, which sold for $28,453,000 at Sotheby’s New York on May 16, 2018.